Summit High School sophomore defense Taylor Ash kicks the ball during the home match against Grand Junction High School Thursday, March 29, in Frisco. Summit High School senior midfielder Shannon Hogeman controls the ball during the home match against Grand Junction High School Thursday, March 29, in Frisco. 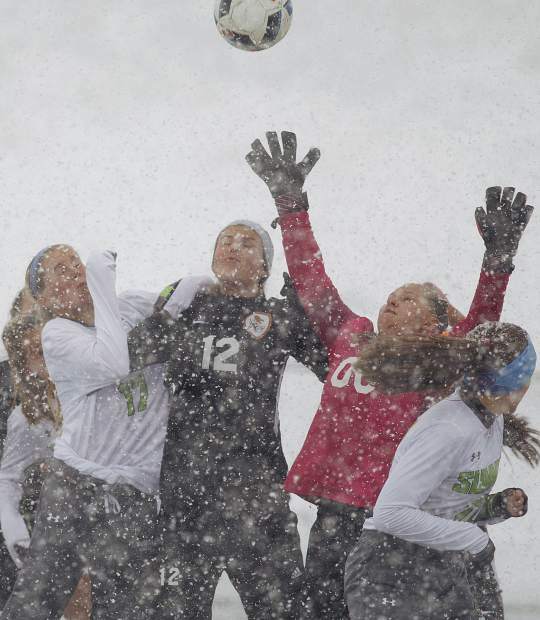 Summit High School and Grand Junction High School go after the ball Thursday, March 29, in Frisco. Thursday, March 29, in Breckenridge. Summit High School senior midfielder Haleigh Lecklitner drives the ball downfield during the home match against Grand Junction High School Thursday, March 29, in Frisco. 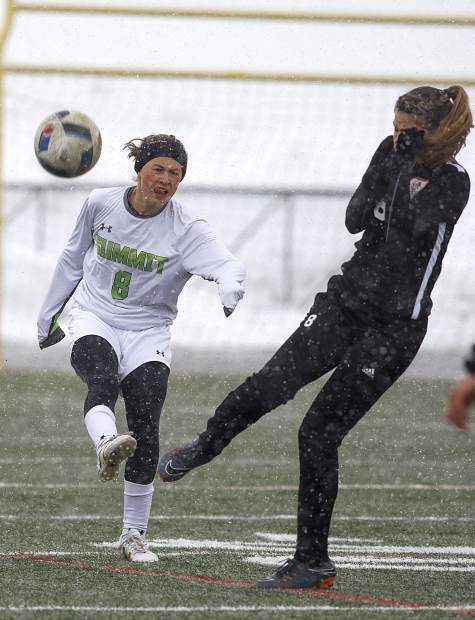 Summit High School sophomore midfielder Samantha Cheek attempts to head the ball over Grand Junction High School senior midfielder Tanner McCann during the home match Thursday, March 29, in Frisco. 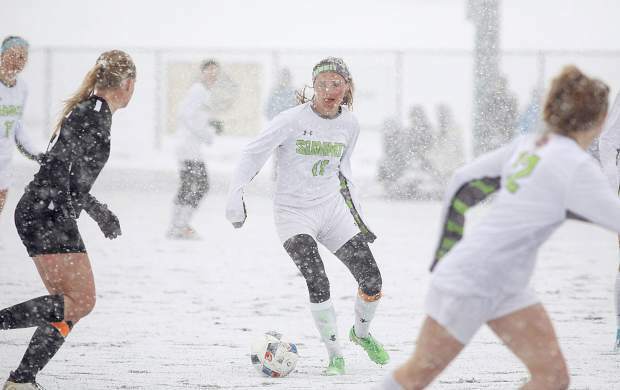 It was a snowy soccer scene at Summit High School on Thursday afternoon, as the Tigers of Summit took on the Tigers of Grand Junction High School. Entering the game, Summit knew they had a tall task in front of them, as Grand Junction entered the match undefeated on the season, at 6-0. 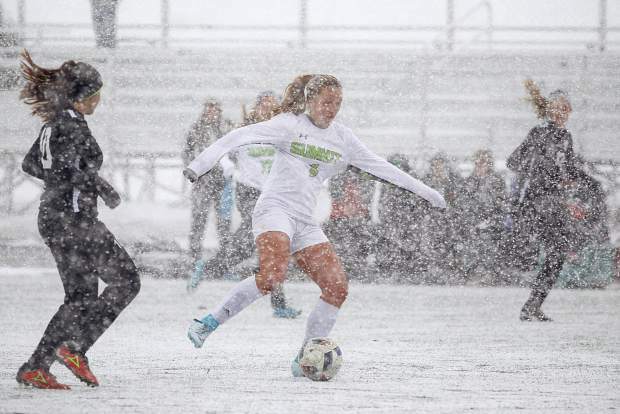 By game’s end, and as snow continued to blanket the field and make conditions tough for both sets of Tigers, Summit fell to Grand Junction by the score of 3-0. 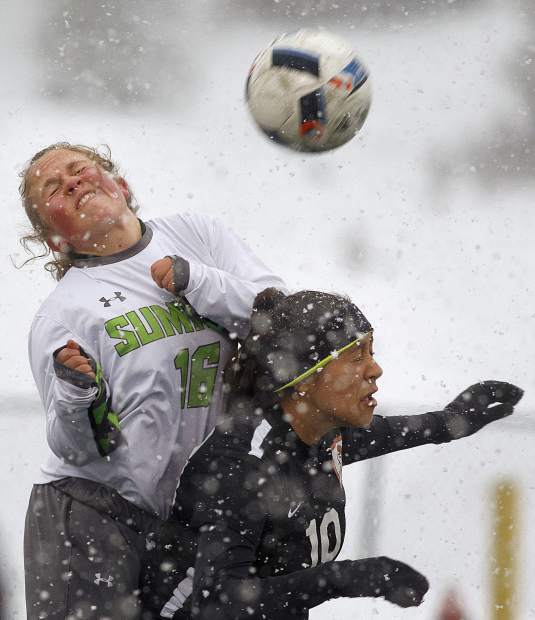 The loss pushes Summit’s record on the season to 3-5, 2-4 in the seven-team 4A Western Slope girls soccer league. 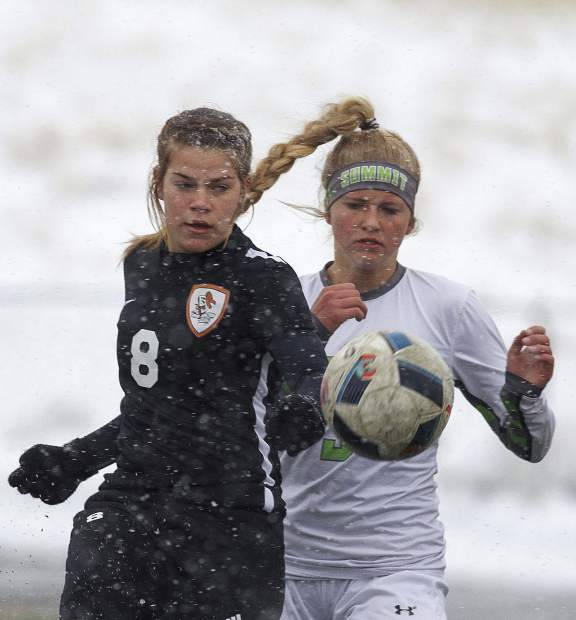 For the season, Summit senior Piper Kunst leads the team in scoring, with seven goals on the season, including a stellar three goal and one assist effort in Summit’s thrilling 4-3 March 22 road victory against Conifer High School. Kunst and her fellow senior playmaker Tanner McCann have led the Tigers thus far through this year’s campaign, as McCann leads the team in assists, with six, and is second on the team in goals, with six. In the Tigers pair of 3-1 losses to Steamboat Springs on March 24 and 27, McCann registered both of the Tigers goals. The Tigers next game is at Rifle — a team they defeated 10-0 at home on March 15 — on April 3. Their next home game is against Glenwood Springs on Thursday, April 5, at 4 p.m. The Summit girls lacrosse team improved its record to 3-5 on the season with their 9-7 road win versus Durango on Saturday. The Tigers blitzed the Demons in the second half with six second session goals to pull away for their first win since a 16-5 home triumph the Saturday prior against Denver North. For the season, Summit senior midfielder Erin Scott-Williams leads the team in points, with 17, including a team-leading 15 goals. She also leads the team with 30 groundballs on the season. Tigers junior goalie Aguiar Porter has stopped 62 of 79 shots on the season, for a save percentage of .784. The Tigers next game is Wednesday, April 4, at Steamboat Springs. Down in Fort Collins on Friday, March 23, the Summit Tigers girls track and field team took 13th place of 21 schools at the Runners Roost of Fort Collins meet. The 13th place finish followed Summit’s fifth place finish at their only previous event of the season, at the March 16 Rifle Invitational. In Rifle, Summit senior Cassidy Bargell finished sixth of 58 sprinters in the 100-meter dash. Bargell also finished in third place of 56 sprinters in the 200 meters and finished in seventh place of 29 sprinters in the 400 meters. In the 800-meters, Summit’s Noelle Resignolo finished in fifth place of 41 runners. And in the 1,600 meters, Resignolo ran to a fifth place finish of 43 runners. In the 100-meter hurdles, Tiger hurdler Hunter Stimson finished in third place of 21 hurdlers while teammate Anna Confer crossed the finish line in eighth place. Stimson bested that effort in the 300-meter hurdles, where she finished in second place, just under 1.3 seconds behind champion Ginny Bergstrom of Glenwood Springs. Confer took 10th in the race. The Tigers best relay finish in Rifle was a third place showing in the 4-x- 200-meter relay. And in the field events at Rifle, Summit’s best showing was a fifth-place result in the triple jump by Emma Howard. Resignolo finished in fourth place of 35 runners in the 800 meters and in second place of 34 in the 1,600 meters. In the 100-meter hurdles, Summit hurdlers Hunter Stimson and Anna Confer tied for eight place. Stimson also took third place in the 300-meter hurdles.